Black Cat Animal Nose...Made of Soft Decorated Vinyl. Elastic makes it easy to apply and secure around face. Non - Toxic and Non-Flammable. 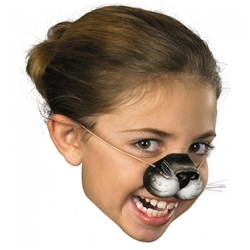 The black cat animal nose is a quick and easy way to create a cat mask for both kids and adults. The nose can be used for theatrical and school productions, school projects, Halloween costumes, and year round costume dress-up fun. Nose is pictured on a child but is one size fits all including adults.